Secret Song Designs: Happy New Year! 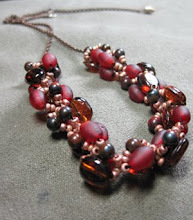 I made this to go with a New Year's Eve dress. 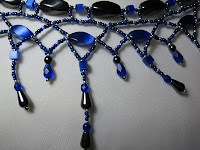 The dress is almost the exact shade of the blue beads. I'm very pleased with how it came out and how it sits. 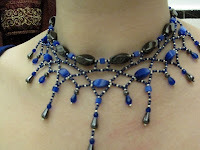 I've had trouble in the past with netting type of necklaces not falling correctly when worn, but this worked out well. Earrings to match are on their way.